Attract and retain the workforce of the future through continuous feedback on company culture and leadership. SurveySaurus equips leaders with insights and people data so they can ask the right questions and make better informed decisions. By collecting and analyzing valuable data through continuous feedback and ROI on people and culture development, SurveySaurus helps organizations ensure that their talent remains a key competitive advantage. SurveySaurus provides insightful, customizable surveys, data and analysis to drive immediate change and get bottom line results. Work from user-friendly, pre-built survey templates or create your own. We have options to add as many users as needed, so that everyone from owners to managers can measure behaviors that correlate to the success of their team and stay accountable. 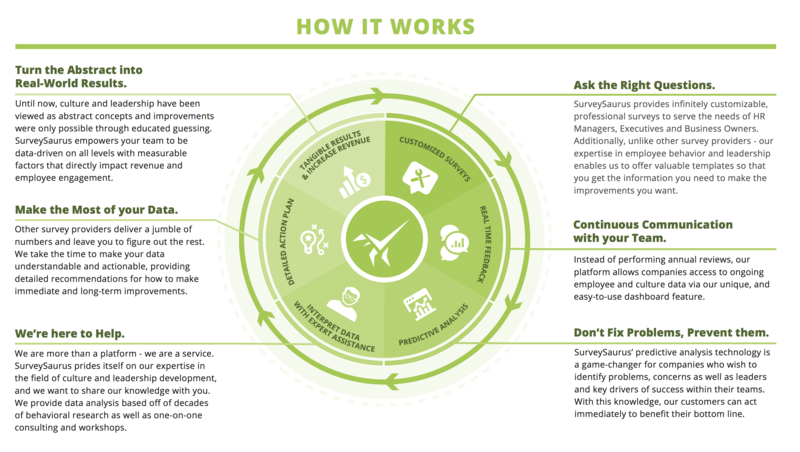 SurveySaurus provides data when you need it most. Get instant feedback, and predictive analysis on People, Culture and Performance. Currently in beta - help us build our analytics database! SurveySaurus makes it easy to start transforming your company and its people. Launch your free trial and explore what makes us the leader in qualitative performance measurement. Get Connected - Register and create an account. SurveySaurus makes it easy to start transforming your company and its people - when you launch your free trial you can immediately explore what makes us the leader in qualitative performance measurement. Select Survey - Choose from prebuilt templates or customize your own. We understand your team is unique, and for that reason we have built a platform that allows for infinitely customizable survey templates - as well as prebuilt, proven templates to measure and address a variety of challenges that HR, Executives and Owners face. If you are looking to create your own survey for any organizational need, we provide that free. Take a look at the “Create a Survey” Section. Identify Recipients - Create a customized email to be sent with survey link. Your team deserves more than a cookie-cutter email - easily send and personalize your message with your survey to let your team know the benefits of our unique approach and how this will help improve their experience and their business as a whole. Choose Package - Select the survey package that best suits your needs. SurveySaurus is committed to providing value to you and your team. That is why all of our basic surveys are available free of charge. If you need more customization and advanced features, we have a variety of packages that can be adjusted to fit your company’s needs. Remember, basic surveys are always free. Send & Track - Track and review survey responses in real time. Our easy-to-use dashboard presents data collection for you to monitor real time so you can start implementing changes or continue existing programs right away. View Reports - View and print professionally formatted reports, if needed. We are committed to helping you put this new data to work, creating tangible results for your team and bottom line. Our reports help you to better retrieve and understand qualitative data in a way that no platform has been able to do, until now. Create unlimited surveys with our standard survey templates - completely free.